YOU GUYS! Your comments are always so lovely, but somehow your comments on the last post were particularly kind (in addition to giving great feedback on the design) – thanks for making it so fun to share our flips with you. 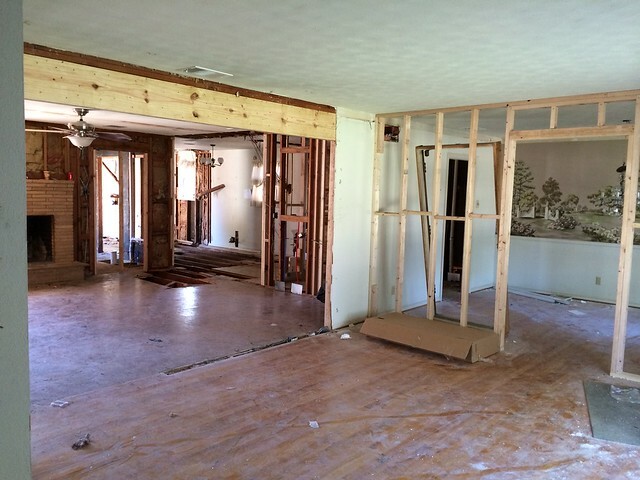 But back to the topic at hand – we’ve talked a ton about the design over at our 10th flip (here, here, here and here), and you’ve seen the “before” pictures, but a lot has been going on behind the scenes! 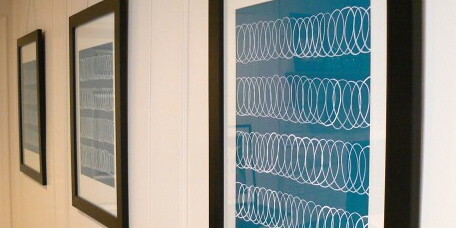 Want to see how those changes look in real life? 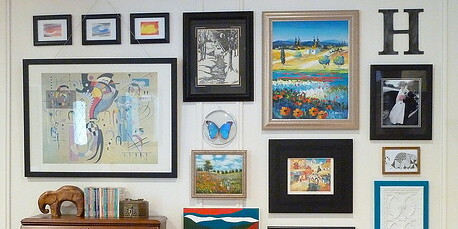 All of that changed when a wall was framed to separate the two spaces. 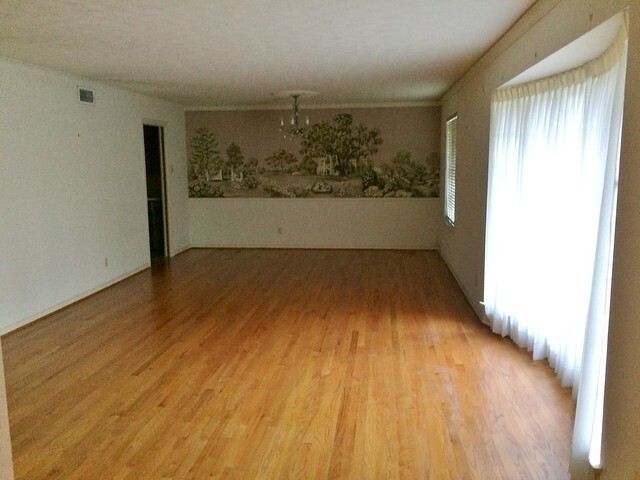 Now the room with the bay window is the dining room, and the room with the wallpaper mural (whoa) is a fourth bedroom/office. 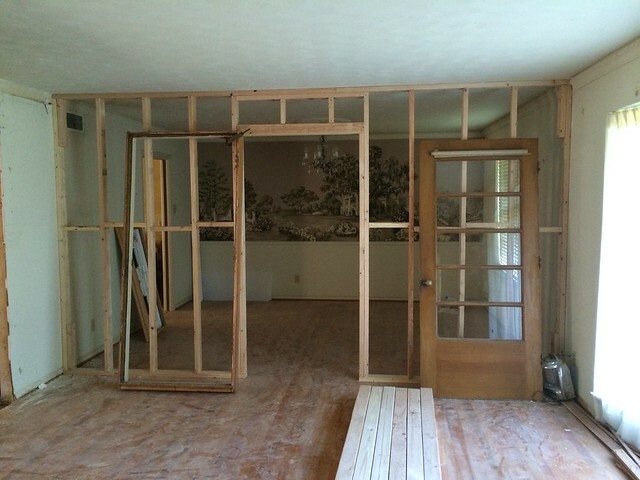 The door that you see leaning against the framed wall will act as the door into the fourth bedroom, and it was originally an exterior door salvaged from another part of the house. I love it! With the addition of a new header, the dining room and the living room are now open to each other and the space feels so much bigger. I also love that you have an expansive view of the house from the front door. 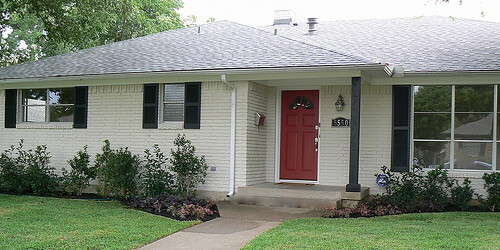 Can you see the great sightline from the front door? Here it is all opened up. 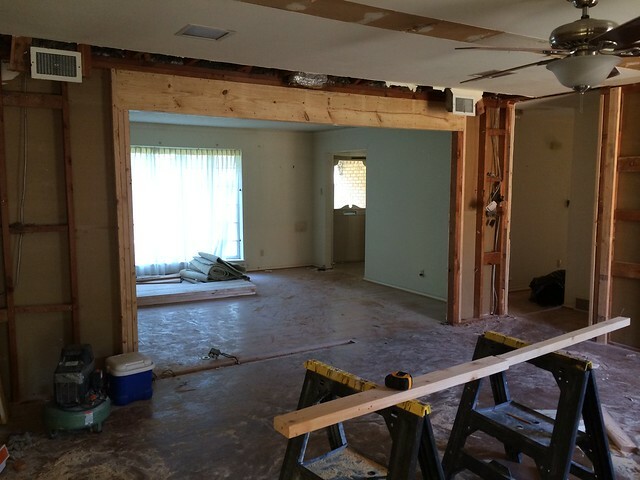 And you can also see that we took out the door from the living room to the hallway, opening it up side to side and from floor to ceiling. 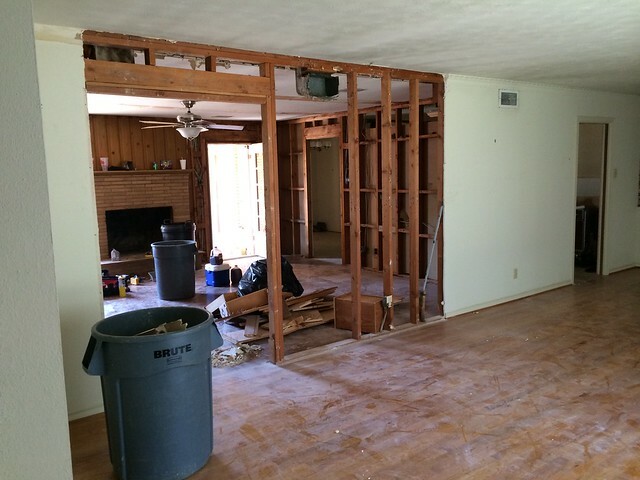 We did this for two reasons: (1) for a more open-feeling floorplan, and (2) because we needed to add another air return in the hallway and the A/C guy couldn’t put it in the hallway if there was a door that could close it off from the rest of the house. 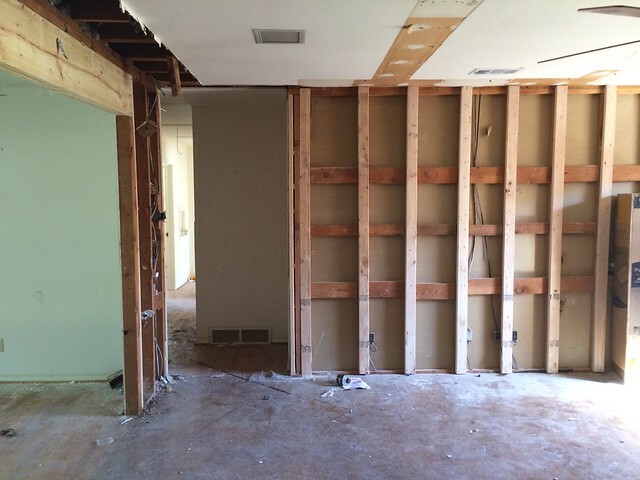 It is a little hard to tell in the photos above, but for some reason this wall below was originally framed as a “thin wall” – the 2 x 4s that the wall is built out of were turned sideways. That makes the wall a little less sturdy than normal, and it also caused an awkward angle in the wall, so the framer faced the wall with additional 2 x 4s to thicken up the wall. There’s a lot of stuff going on on the kitchen side of the house, but this post is getting really long so let’s save that for another day, okay? 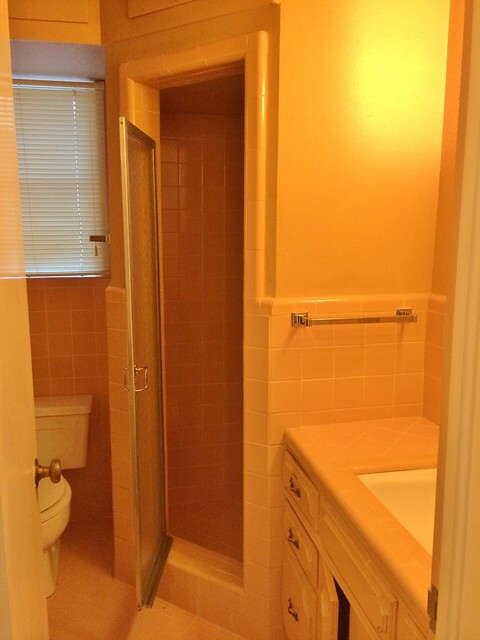 For now, let’s swing over to check out the bathrooms that serve the 3 bedrooms on the east side of the house. 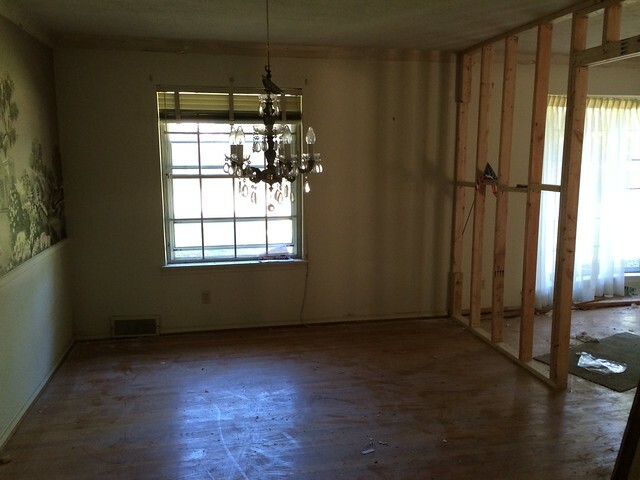 Below is the master bathroom – I know, pretty underwhelming. 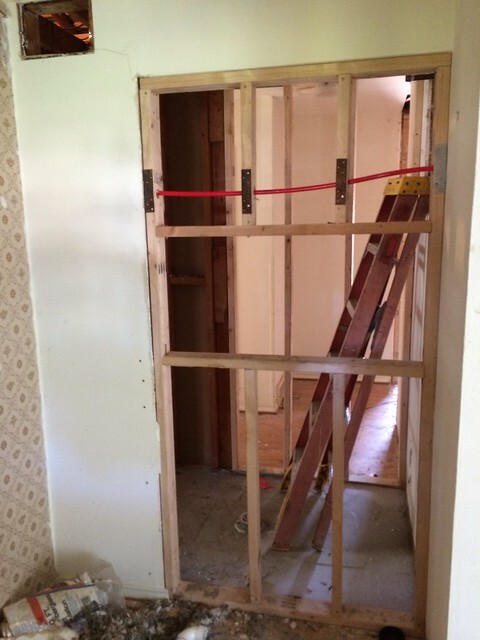 We closed off the doorway from the hall so that the master bath is private and can only be accessed from the master bedroom. We also switched around the locations of every fixture, and took in a coat closet and part of a hallway to create a large shower. 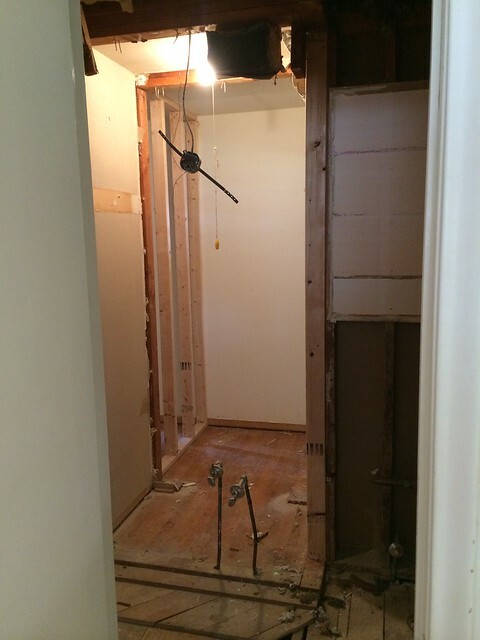 You can see below that you used to be able to access the bedroom wing from the entryway via that short hallway (that had a coat closet) – but we closed in the hallway and that’s now the shower in the master bathroom! 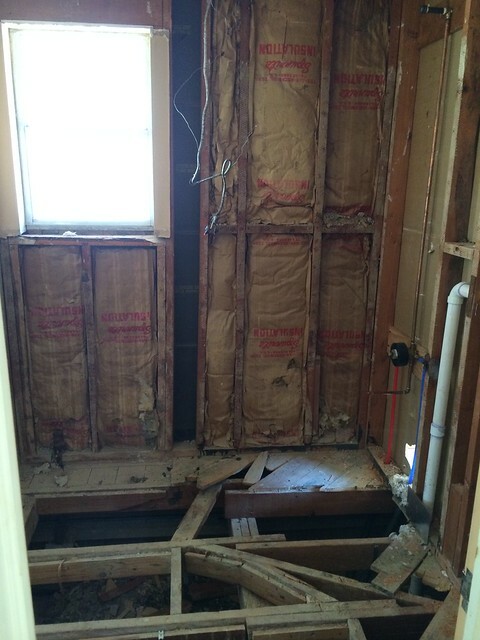 And the guest bathroom is now just a guest bathroom – we closed off the doorway from the master bedroom. 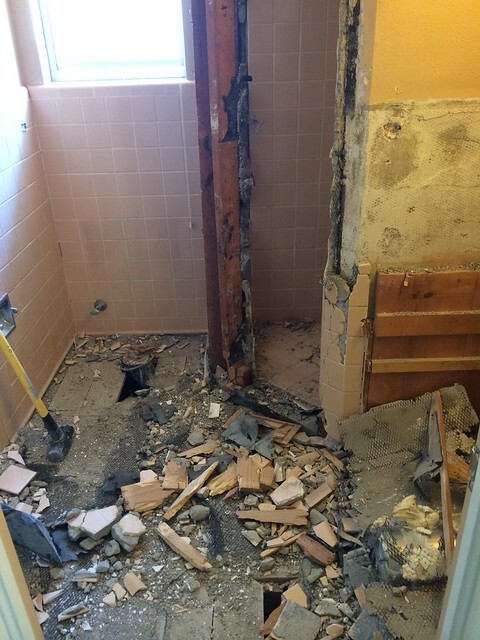 It took forever for the guys to demolish these bathrooms – tile used to be set in a few inches of concrete and wire mesh, designed to last a lifetime! If only that pink tile had stood the test of time . . . This layout got a bit of a switcheroo as well, with the toilet flipping over by the doorway, and the stand-up shower converting into a tub/shower combination. I’ll save the rest of the inside for the next post, so for now let’s head out to the front yard. 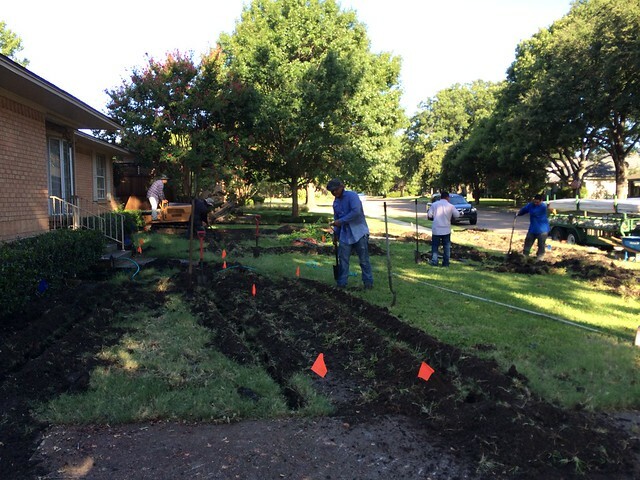 We had a sprinkler system put in the front and backyards – I vowed after our first flip (a.k.a.” the summer we spent our entire lives watering new sod in 100+ degree heat”) that we would never again flip a house without a sprinkler system. 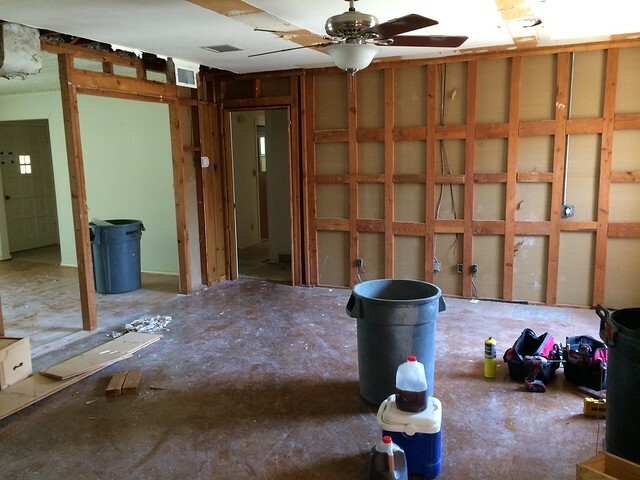 Well, I ate my words with our 3rd flip but with this house we went ahead and sprang for a sprinkler system. Worth every penny! How do you think things are coming along so far? Jeez, you guys are fast!!! You are on the ball! Looking great and I love the use of the old door. Yes, it would probably be an office or other space besides a bedroom so good thought on the cool door. That would be a great way to add a new element without putting off a customer, I think! Old, salvaged doors I think most buyers would be good with. Also, I wanted to share (since you opened your post with the thank you) that you always seem to REALLY want to hear our two cents when you ask for our opinion. I think your readers appreciate that and you respond in kind to the comments. We feel your appreciation for our input. 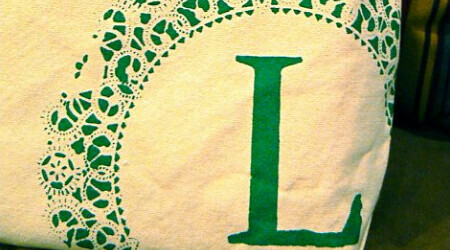 :) Thank you for the fun posts and if you ask, we will answer! :) We have to live vicariously through you! 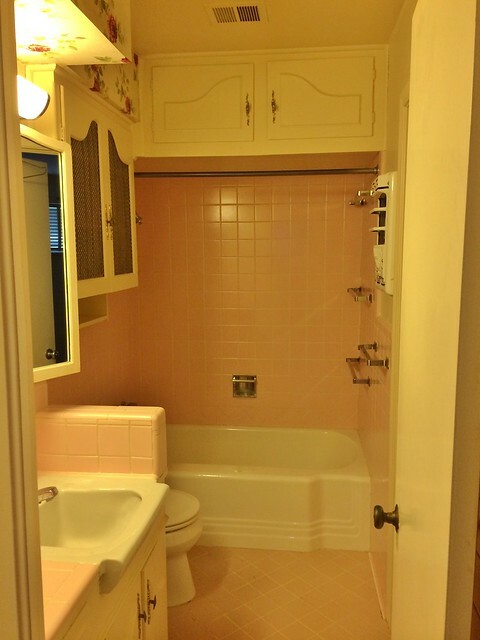 Ha, that pink bathroom looks just like ours did! So funny. Flashbacks. We live in southern California and just put in some new sod just recently. That stuff is already dieing and it has been really hot lately. Hopefully it will cool down so it doesn’t all die. Hey Liz, I am loving where this flip is going! 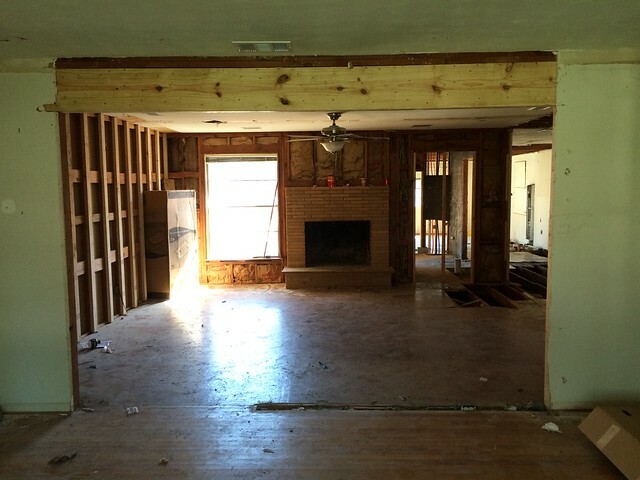 I too am in Dallas and live in a similar floor plan with the formal dining/living room. 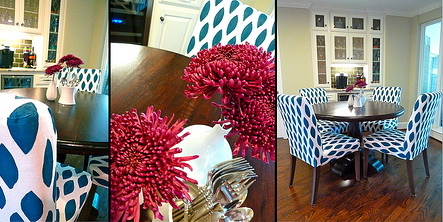 I would have never thought about making the formal dining into a 4th bedroom/office. 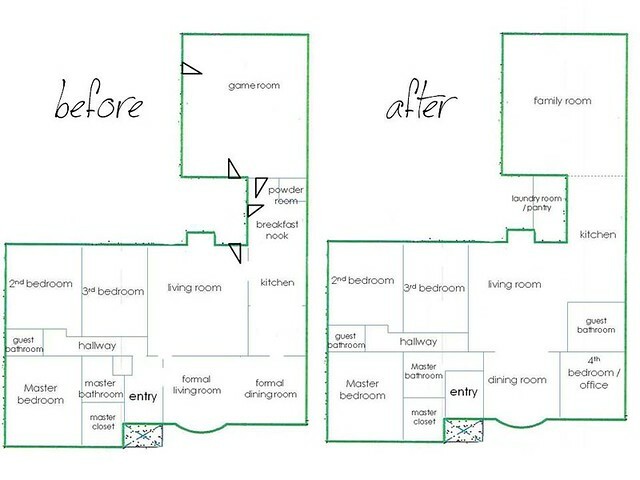 I am curious about the bathroom though, is the door to the bathroom going to be access from the living room? Or will they have to go through the office? I am just TOTALLY curious, and trying to think if this is possible for our house? :) My parents have a home where the bathroom is accessible from the living room, and it just totally bothers me :) As always, I LOVE what you are doing! Soooo, that bathroom off the 4th bedroom – we went back and forth about whether to have secondary access to it through the living room or kitchen, and ultimately decided that both options would be a little weird (and we couldn’t really make it work anyway because we had to add a closet in the bathroom). Instead, we opted to add a powder room that is accessed through the laundry room/mud room – still not 100% ideal, but better! Seems like you guys have taken quiet a project on your hands again! I can’t wait to see the end results. I’m very curious to see how the room with the fireplace will look like! Looks like it’s well underway. 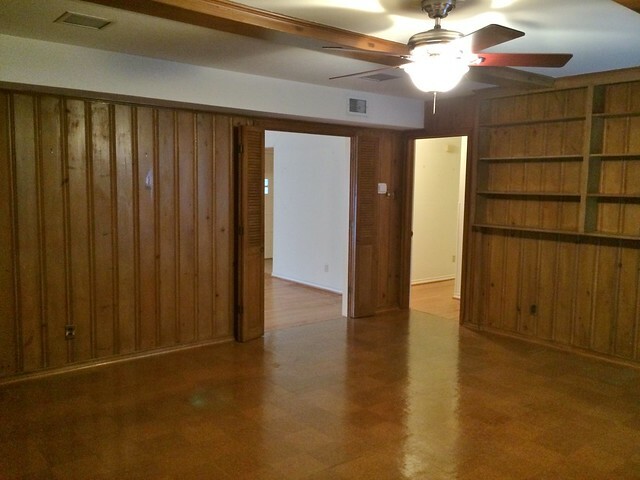 I’m always impressed how you seem to visualize a space and move rooms around. Do you work with an architect? I feel like HVAC is one of those things I wouldn’t know how to handle if I did it myself. 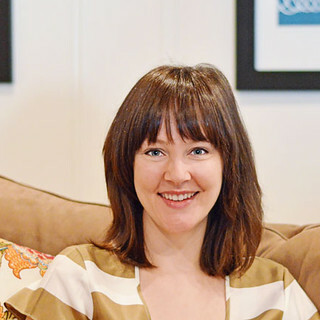 If you do it yourself, how do you handle getting plans so that you can get your permits? (Apologies if you’ve answered this before). Oh my gosh, so much is happening, and it is all wonderful!!! Who sizes your headers for you? We wanted to open up the wall between our kitchen and dining too and I’m afraid it is load bearing. Hi! 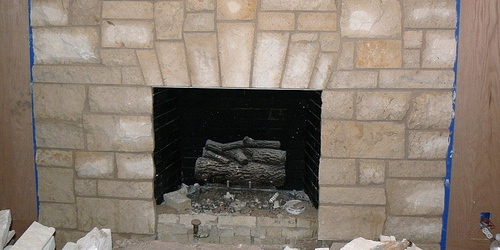 For that type of work you’ll need a permit, and either a structural engineer or a pro framer. Hope that helps!